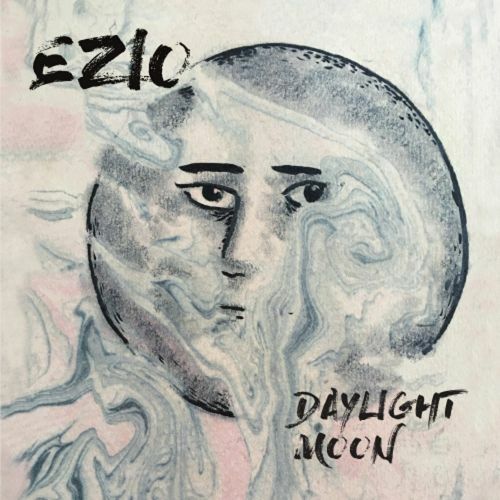 Daylight Moon is the ninth studio album in a career spanning 26 years from Cambridge-based band Ezio. A popular online encyclopedia would have us believe that this is a folk music band, but judging from the smorgasbord of musical sounds and styles found on this album that is a far too simplistic description and exposes the limitations of trying to pin labels onto musicians. From the start, main man Ezio Lunedei keeps us guessing. Hey Little Girl is a gentle but upbeat opening solo outing for Ezio that acts as an outlet for his skills with a ukulele. This does nothing to prepare you for the thumping, Indian reservation style drums and electric guitar-driven riff on Indian, an ode to feeling overcome by forces beyond his control. Guitarist Booga Fowell is both the compliment and the foil to Ezio’s rich tenor and complex acoustic guitar work. These two form the core of the band and, depending on the size of venue, they perform either as a duo or with a full band. The songs on this album provide material for both scenarios. Dirty Little Secret, Pain in My Heart, and Daylight Moon are stripped back tracks with the subtlest of musical accompaniment. Contrast these with the guitar-driven blues-rock of Crushed or No Time For You, a track with a late Beatles feel to it. Aside from Booga there are no less than 10 other musicians credited with input on this album, and they all contribute to the wonderfully diverse sound on show here. The Gypsy Song is a gem that shows off the talents of Wolfgang Wehner on violin and the double bass of Lyn Seton. The overall feel, jazz rhythms and brilliant guitar work on this track brought to mind Al Stewart and Laurence Juber at their best. Been a Long Time Coming is another cracker; upbeat, brilliant guitar work alongside a vocal performance reminiscent of Van Morrison on one of his happy days. There are albums where constant switches in style or tempo are jarring, which means that the album struggles to form a coherent piece of work. ‘Daylight Moon’ is not one of those albums. The variety of songs on show on this album instead demonstrates the skills of Ezio Lunedei as a songwriter and his ability to surround himself with musicians that showcase those skills in the best possible manner. Comparisons to other musicians should not be taken as statement of a band without a distinctive sound of their own. Rather, this is a band that defy pigeon holing or labelling and will, in their own words, “dabble in any style of music that takes their fancy”. The fact that the comparisons are with legends of the music industry should, instead, give a pointer to the quality on show here.